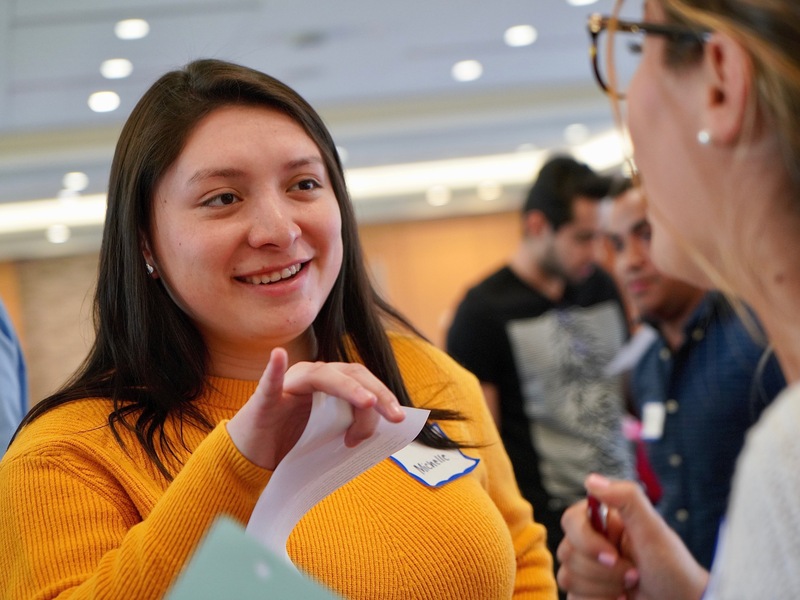 Students stepped into the lives of migrants—those crossing the border both legally and illegally—at a Rose Hill workshop on March 27. As part of a two-day forum called “Voices from the U.S./Mexico Border,” Campus Ministry hosted an interactive workshop where students could better understand how difficult it is to immigrate to the U.S. Leading the workshop was Joanna Williams, director of education and advocacy at the Kino Border Initiative (KBI)—a faith-based organization on the U.S./Mexico border that serves deportees and asylum-seekers. “One of the most common questions that comes up for us is, ‘Why aren’t people just coming legally? Why are people trying to cross the desert instead of just going to the consulate and getting a visa?’” Williams said. The workshop attempted to provide an answer. 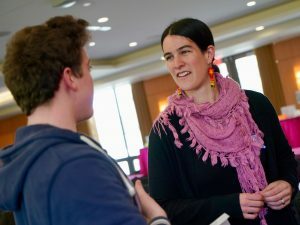 Joanna Williams speaks with a “migrant” student. In Bepler Commons, Williams simulated the crisis at the southern border with about 30 students. To the right of the room: a group of chairs labeled “U.S. consulate,” where migrants apply for U.S. visas. To the left: the “port of entry,” where migrants show their documentation to U.S. Customs and Border Protection officers. And finally, in an empty area between the two stations was a “third-world country”—the group of countries migrants were fleeing from. Each student was then given a slip of paper that explained their new identity. Some of them were border patrol agents and visa interviewers. Others were migrants attempting to legally enter the U.S. But if they found no legal way in, the student “migrants” could break the law. One student, for example, successfully entered the U.S. with fake documents. What made the simulation special was each of those characters. They were based on actual individuals—migrants who Williams and her colleagues met through the KBI or U.S. state department employees. 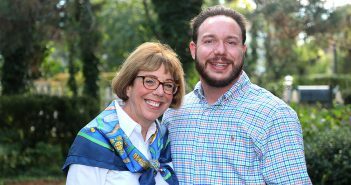 Christopher Shoudt, a first-year Gabelli School student, played a migrant. He was “Josué,” a coffee bean farmer from Chiapas, Mexico, who made 75 pesos a day—the equivalent of almost $4. He bartered his belongings in hopes that he’d be able to work in the U.S. and pay for his children’s education. But in the process, he lost his home in a scam. Living Josué’s life for 30 minutes humbled Shoudt. It made him reflect on how privileged—and lucky—he is to be able to afford to attend Fordham. He also said the simulation better prepared him for an upcoming meeting with New York Senator Kirsten Gillibrand and Congressman Jose Serrano, where he planned to advocate for a Catholic Relief Services initiative to help migrants. A “migrant” student tries to negotiate with an employment/student recruiter. “I hope I can bring [the issue]to her and show exactly what was shown to me today—to understand their situation and be able to empathize a bit more,” Shoudt said. In an open, post-simulation reflection, students spoke about other things they experienced during the role play. Among them were pawning wedding rings to purchase legal papers and watching wealthier migrants receive aid more quickly. In a more dangerous situation, a drug cartel told a migrant that he and his family would be killed if he stopped paying them. Migrants weren’t the only ones who faced difficulty. So did those on the U.S. side of the border. For her, it was a “sad” situation. But for actual migrants, it’s their life. “As much as it feels realistic, this is still a fraction of how real it is,” said Brett Musalowicz, a Fordham College at Rose Hill senior. 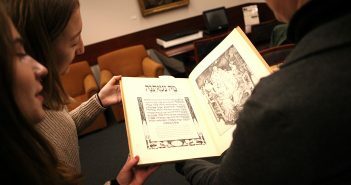 For one student, the simulation was a close parallel to a past experience. In her junior year of high school, Gabelli School sophomore Samantha Barrett visited the Kino Border Initiative and met migrants who had recently been deported, she said. One of them was a man named Raul, a 29-year-old Mexico native who was taken to Los Angeles when he was three months old. 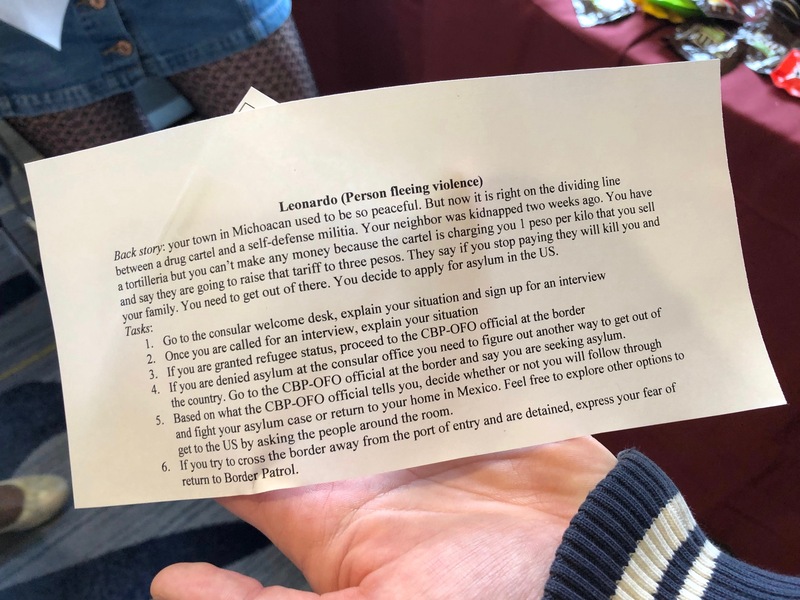 Overall, the simulation at Rose Hill was a chance for students to recognize the complexity of the U.S. immigration system and expand their empathy for migrants who, far too often in news headlines, are simply a statistic.